The lower jaw, known as the mandible, moves by the contraction and relaxation of muscles. It is only the mandible that moves when eating or talking and not the upper jaw (maxilla) which is part of the skull. As with muscles anywhere in the body, these jaw muscles can become stiff and sore at times, affect the movement of the mandible and even strain the jaw joint (temporomandibular joint/TMJ). Tightness of these jaw muscles is a common problem which many of us ignore if it is not painful or stiff to the point where it hampers movement of the jaw. There are four muscles that are responsible for moving the mandible (lower joint). These four muscles are also known as the muscles of mastication, or simply the chewing muscles. Masseter muscles – one on either side which we often refer to as the cheek muscle. 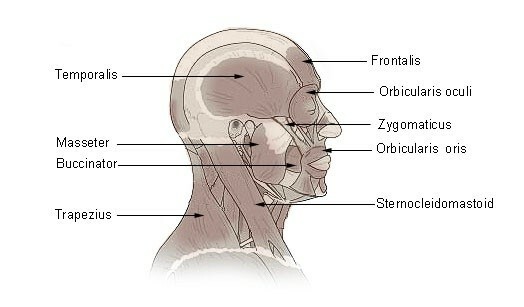 Temporalis muscles – one on either side which is mainly located on the temples of the head. Medial pterygoid muscles, also known as the internal pterygoid, which lies deeper in the cheek. Lateral pterygoid muscles, also known as the external pterygoid, which lies above the medial pterygoid. It is a combination of these movements that makes chewing possible, as well as talking. When these jaw muscles become stiff or sore, chewing and talking can become difficult. Sometimes temporal headaches and jaw clicking may accompany the jaw muscle problem. Any injury to the muscles, either externally or internally, can lead to inflammation (myositis) which may result in muscle stiffness, soreness or pain. This can occur with a blow to the face, fall, during surgery or other such instances. Usually the causative event is identifiable and muscle symptoms start immediately thereafter. Overuse is probably one of the most common causes of stiff and sore jaw muscles. It can occur with biting down repeatedly on very hard foods, chewing for long periods (like gum and tobacco chewing), talking excessively or laughing loudly for long hours. The jaw muscles are working repeatedly and often cramp with stiffness and soreness arising thereafter. Bruxism is another very common cause of tight jaw muscles. The stiffness and soreness is also due to overuse but bruxism needs to be understood separately. It is a condition where a person unconsciously grinds or clenches their teeth. Some people do this while awake, others only when sleeping (sleep bruxism). It can occur as a complication of other disorders like Parkinson’s disease but is very often related to psychological stress. Sometimes a malocclusion of the jaws, acid reflux, dental pain and certain medication may cause bruxism. Tetanus is a condition where there are painful muscle spasms of the neck and jaw in particular due to the toxin of a specific bacteria, Clostridium tetani. This toxin affects the nervous system and in some instances can become life-threatening when it affects the breathing muscles. The condition is often called lockjaw (trismus) because the mouth is unable to open properly due to painful spasm of the jaw muscles. It is a rare condition in developed countries due to immunization programs. There are number of other causes which may not be a problem with the jaw muscles itself but rather affect the jaw bone, joint or other nearby structures. There may also be diseases that affect muscles anywhere in the body, and not the jaw muscle specifically. Muscle relaxants to reduce the muscle tension. Painkillers to ease the pain. Botulinum toxin (Botox) injections for severe spasm. Mouth guards to ease clenching of the teeth. Antitoxin and antibiotics for tetanus. Sedatives for severe muscle spasms in conditions like tetanus. Surgery may at times be necessary and the procedure will depend on the causative condition, response to medical treatment and severity. Remember that even if your doctor cannot find any problem, you should also consult with a dentist. Sometimes sore or stiff jaw muscles may actually be an underlying dental problem. If tight jaw muscles are not due to any serious condition then simple measures can sometimes be effective before opting for medication. However, it is important to first seek medical attention. Sometimes the serious conditions may appear with mild and vague symptoms but delaying treatment can lead to dangerous complications. Do not stop any prescribed medication or avoid other treatments advised by a medical professional. Rest: Try to rest the jaw as much as possible. Avoid chewing on hard foods, talking excessively or laughing loudly. Keep the jaw relaxed but do not force it open. Bite guards can be useful to rest the jaw even if you do not clench. Ice: Apply an ice pack to the area if there has been a recent injury like a blow to the face. Do not apply ice directly to the skin. Icing should not be done for more than 20 minutes at a time. Heat: Use heat therapy if there is no clearly identifiable injury and the muscles seem to be tight due to cramping. The heat application should be very warm but not hot. Massage: Gently massage the jaw muscles if there is no injury or open wound. Light circular motions with the fingers can help with tight muscles. Relax: Bruxism is more common than many people think and stress is a major contributor. Try to relax and sleep if possible. Avoid stimulants like coffee or other caffeinated beverages. Exercise can help with relaxation.